Somerville School, Vasundhara Enclave, Delhi: Oath Taking Ceremony The Inter-House sports activities scheduled for the 2013-14 session began with the oath taking ceremony scheduled on 12th April 2013. Mrs. Tressler, Director Somerville Schools, Mr. and Mrs. G.S. Chauhan, parents of the late Sangharsh Chauhan, ex football captain of the school who has recently died in a road accident and Mr. Manan Chandra graced the occasion. 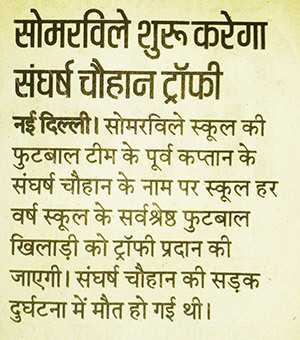 Mr. Chauhan announced that he would sponsor an award for the best football player every year. 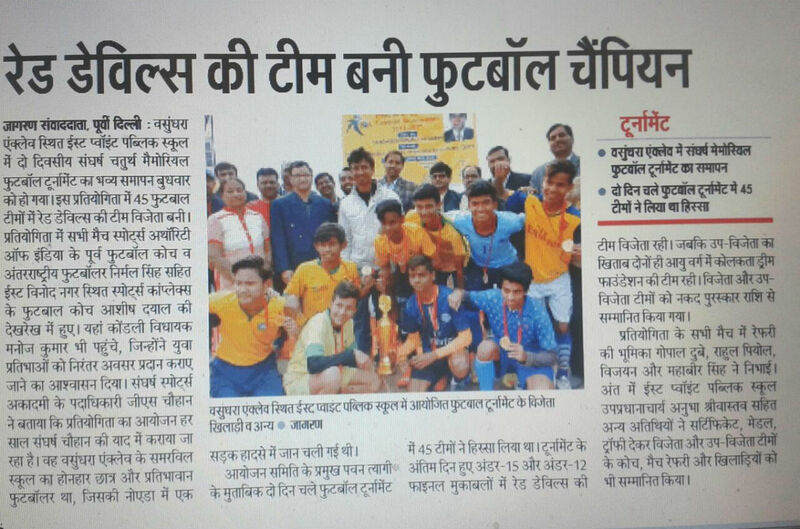 From this year Sangharsh Chauhan Memorial Trophy will be awarded to the best football player in the Junior and Senior category. Mr. Manan Chandra, National snooker and billiards champion administered the oath to the Sports Captain, Prerna Bakhtawar. The Sports Captain lead all competitors to pledge that they will respect their body and keep it clean from all such substances as alcohol, narcotics and tobacco, and compete upholding the ideals of fair play. 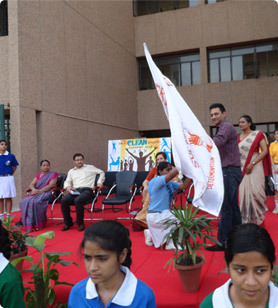 The Inter-House sports activities scheduled for the 2013-14 session began with the oath taking ceremony scheduled on 12th April 2013. Mrs. Tressler, Director Somerville Schools, Mr. and Mrs. G.S. Chauhan, parents of the late Sangharsh Chauhan, ex football captain of the school who has recently died in a road accident and Mr. Manan Chandra graced the occasion. Mr. Chauhan announced that he would sponsor an award for the best football player every year. 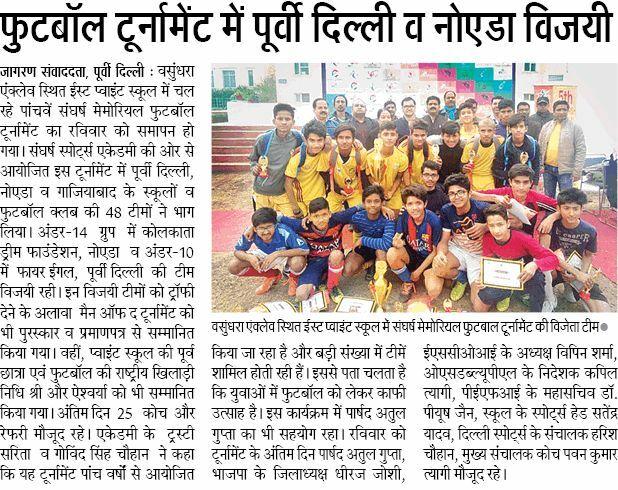 From this year Sangharsh Chauhan Memorial Trophy will be awarded to the best football player in the Junior and Senior category. Mr. Manan Chandra, National snooker and billiards champion administered the oath to the Sports Captain, Prerna Bakhtawar. The Sports Captain lead all competitors to pledge that they will respect their body and keep it clean from all such substances as alcohol, narcotics and tobacco, and compete upholding the ideals of fair play.